The Padres picked up their second sweep of the season! Taking down another NL Central team in the Cincinnati Reds. The Padres then travelled to Milwaukee, where approximately 420 dingers were mashed over the walls and Bernie Brewer clocked over 20,000 steps during this series, climbing the stairs every 3.9 minutes of the games. Our plucky Padres were 2-2 since the last Tuckin’ Hell with no real blowout to show for it. Having Miguel Diaz start and only last 3.1 innings, then the game going into extras was a real blow. He has to go longer, or step aside as a starter, it’s not happening right now. BREAKING: As I’m writing this Dillon Overton (Mariners) was just claimed by the Padres (Out righted to El Paso) and Zach Lee has been designated for assignment. I’m guessing the Padres want a look at the Athletics 2nd round pick from 2013 before deciding they they will try him out in the Majors again. It’s not been good for him up north, so time will only tell if the change of scenery will work. IP – Chacin 7.0, Lamet – 6.0, Perdomo 6.0. So. much. better. Serious improvement and alleviating the pressure on this already rocky bullpen. Shall we talk about is the bats? 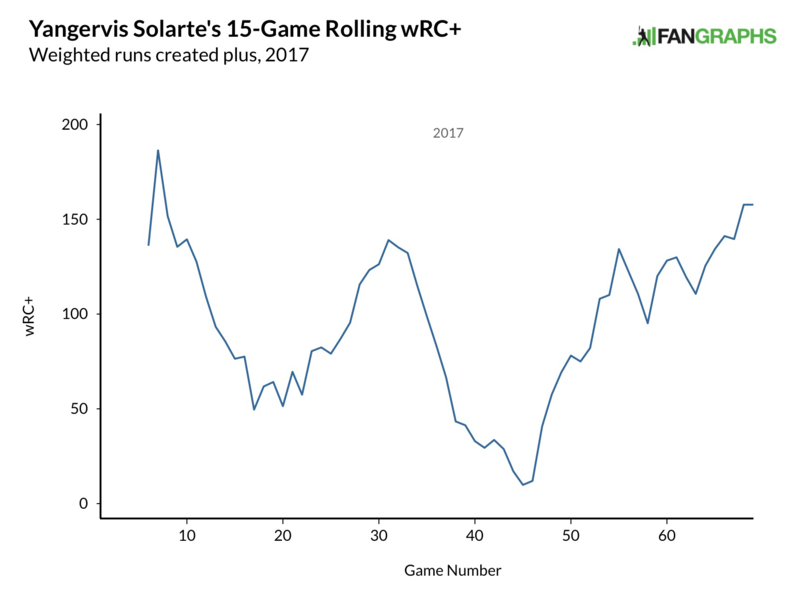 My oh my they have been booming (Ignore Pirela and his little run), Solarte has generated some serious trade talk thanks to a fantastic boom in the last few weeks. Look at that climb! There have been reports that his daughters have just finished school (college?) and now they can travel with him. Maybe that’s one less thing for him to worry about since the tragic death of his wife last year, which allows him to concentrate on his game. This is fantastic primarily for him and secondly for us to watch, as he’s an exciting ball player. What about Franchy Cordero? He’s amazing right? Well, yes and no. He’s got off to a great start in his Padres life, leading team offensive WAR after only 20 games. His wRC+ is currently sat at 132 and his defence although a bit inexperienced at times has been ok. So what was the “no”? Well, his BABIP is currently .472 and he has a 39.2% SO rate, so he’s pretty lucky at the moment and enjoying a hot bat. He’s 22, so he’s young and excited (We’ve all been there), hopefully he can either increase his HR rate or control that SO rate. Otherwise, it’s not going to last. The Padres travel to Chicago and face Lester (4-4 3.89 ERA), Montgomery (0-3 2.56 ERA) and Butler (3-2 4.41 ERA). The Padres will trot out Clayton Richard (5-7 4.30 ERA), Chacin (6-5 5.10 ERA) and finally…urgh, Diaz (1-1 7.36 ERA). It’s all over! After the sweep against the Reds the paying public got nine game at Petco until they Padres won the magic five games.